Your living room is one of the most important rooms of the house. After all, you do a lot of living in it. You want to make sure the whole room is something you will be happy with for a long time to come. Coming home after a long day out, there is nothing better than having a beautiful living room to relax in. Whether you are designing a new living room or remodeling an existing one, you will have many options. Don’t get overwhelmed, we’re here to help. 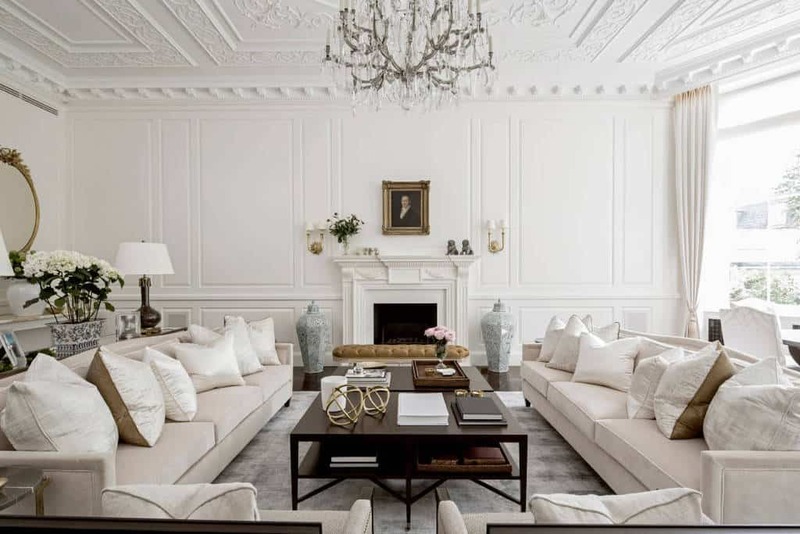 Below, we’ve gathered 50 traditional living room designs for you to browse through. You will notice that they certainly don’t all look the same, and that is a good thing. You have much to choose from. Take your time and find what you want. 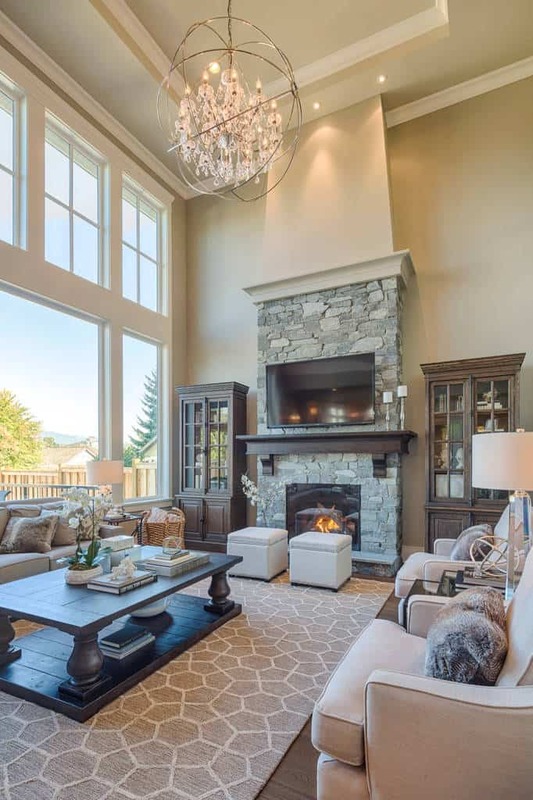 This living room has wonderful features, from the open sense thanks to the windows to the stacked stone fireplace, this space is warm and inviting. With different types of seating all around, ensuring everyone will be comfortable, you will love this living room. With a great color scheme and matching decor, you can gather around the fire here. 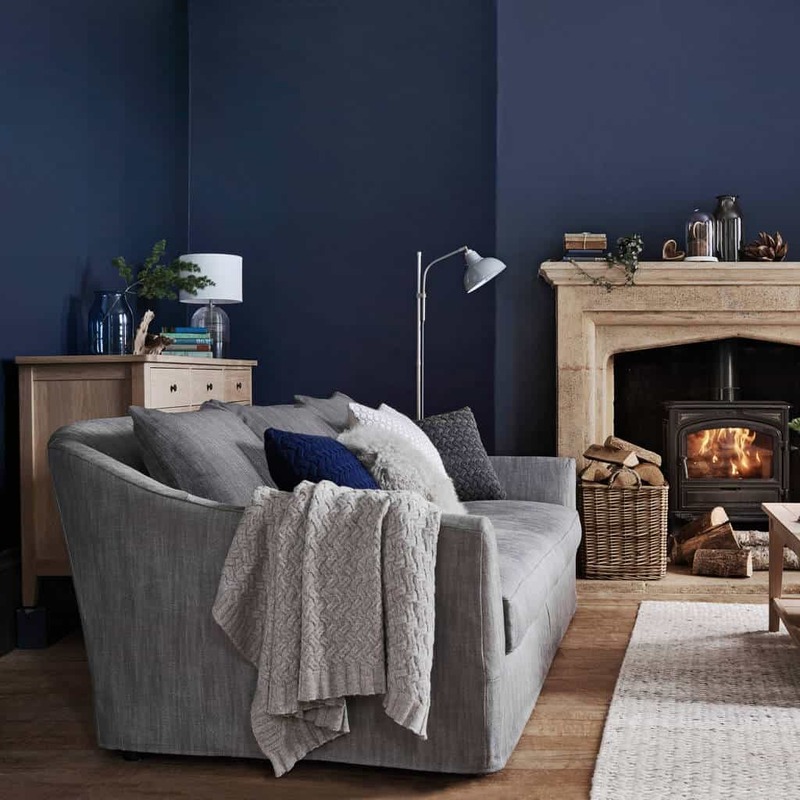 The darker elements of style here, from the floor and table, as well as the fireplace, really create a pleasing contrast to the rest of this living room. The beautiful theme of this living room carries to the kitchen area. All connected by a wonderful hardwood floor, the furniture and decor here work well in the natural light shining in. The exposed beams on the high ceiling are matched by the style and decor of this room. The darker brown elements contrast perfectly with the lighter styles. With its own area, this living room is comfortable and contemporary. Come in here for some quiet time by yourself or host a family game night. Either way, this living room will suit your needs. The darker hardwood floor is met with wonderfully designed furniture and decor. From the beautiful rug to the patterned chair, you can sense the easy style of this living room. 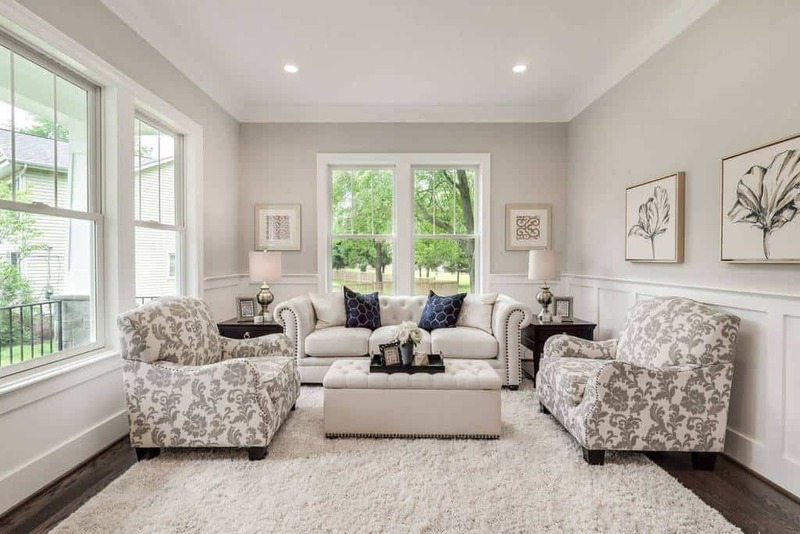 This carpeted living room is the essence of elegance, with wonderful artwork and a light silver color scheme. If you want a classy style, this is the type of design you need. Modern and inviting are the first things that come to mind with this living room. With great shelving options for books or decor, you can relax and watch a little bit of television with the family. 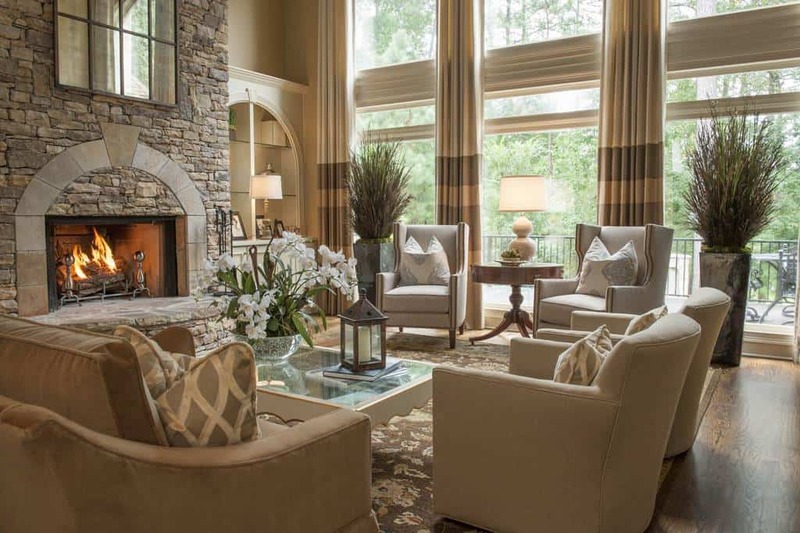 The tall windows in this living room allow the light to pour in to show off the beautifully design room. 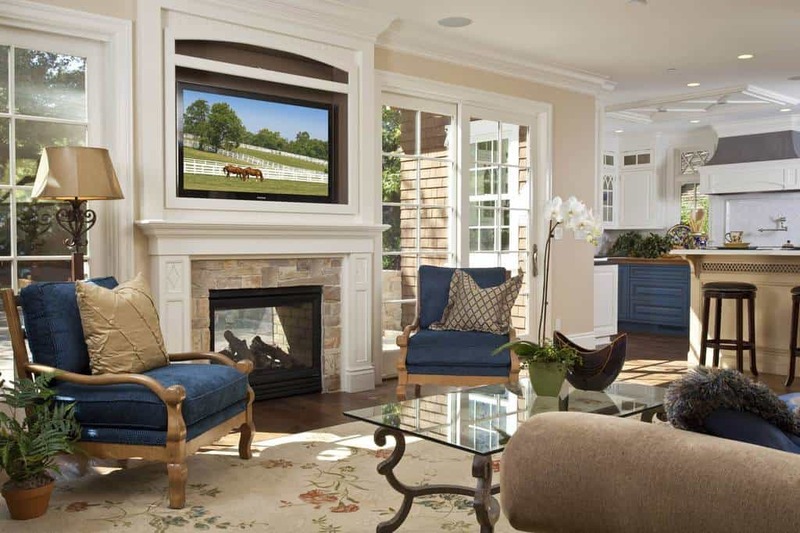 The stacked stone fireplace brings warmth and also hosts a television, giving you plenty of options at the end of the day. The high ceiling brings an open sense to this living room. With a beautiful hardwood floor, you will enjoy gathering on this modern decor with friends and family, kept warm by the great fireplace. This beautiful and warm design features matching decor that really complements the whole space. A stacked stone design can really bring character to a room, and it does just that in this living room. This comfortable space features a fantastic modern decor style. With a great hardwood floor and a solid color scheme, you can gather here for a night of relaxation. 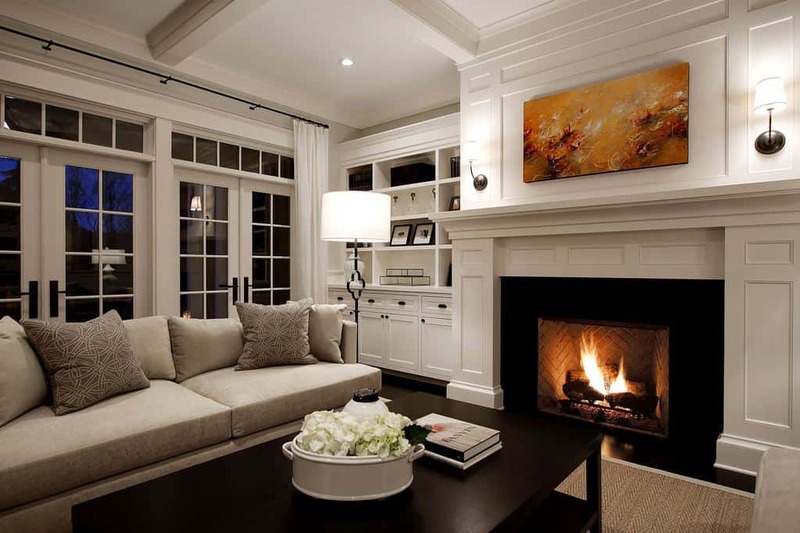 With a beautiful design centered around the warm fireplace, you can enjoy the many options of this living room. The natural light pours in through the windows and you can easily get outside. The simple style of this living room is its strength. With dark hardwood floors and matching tables, the light furniture style is the perfect complement. With a simple yet functional table to gather around, you can appreciate how well connected this living room is the rest of the house. 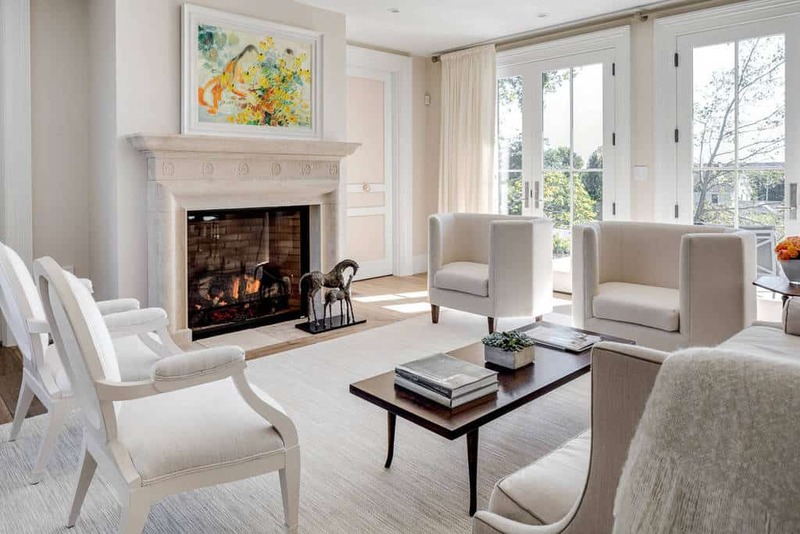 A classy, simple design style is the key to this living room’s charm. 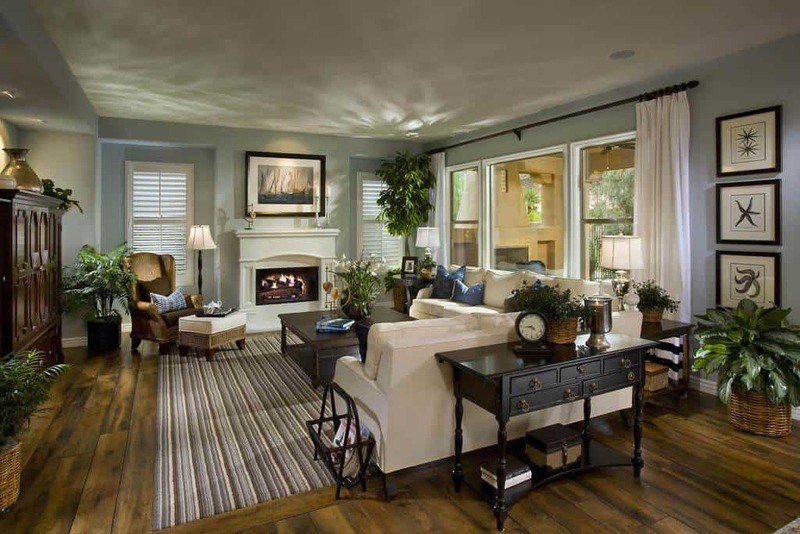 From the hardwood floor to the wonderful decor, this living room will let you gather everyone for a great time. 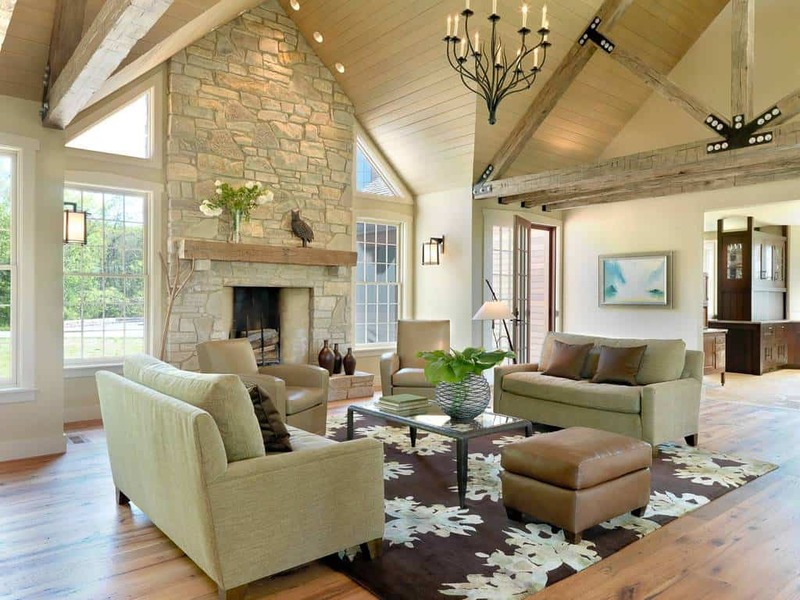 The windows lets the natural light spill into this room to show off the stacked stone fireplace. 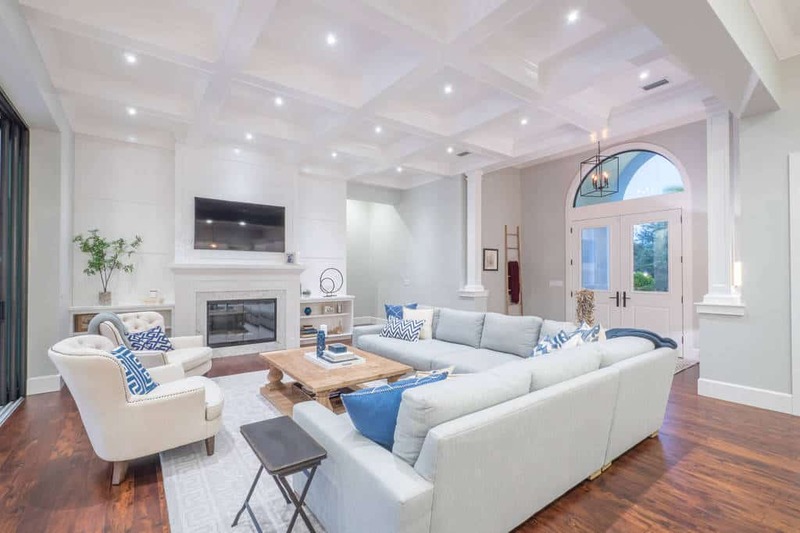 With a beautiful high ceiling, this living room boasts a beautiful color scheme of light brown, blue, and white. The natural light shines in from many angles to provide a welcoming environment. This gas fireplace is stylish and set in beautiful dark bricks. The shelves give you wonderful spaces for books and decor, and have wonderful lighting to show it off. 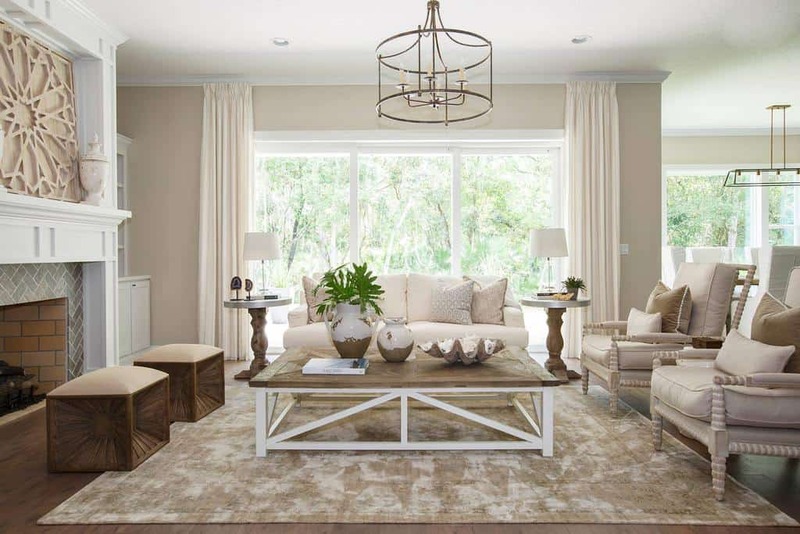 This living room take a country style and builds around it. The whole space is connected to the outdoors, with a fireplace that works in two directions to keep you warm inside and outside. 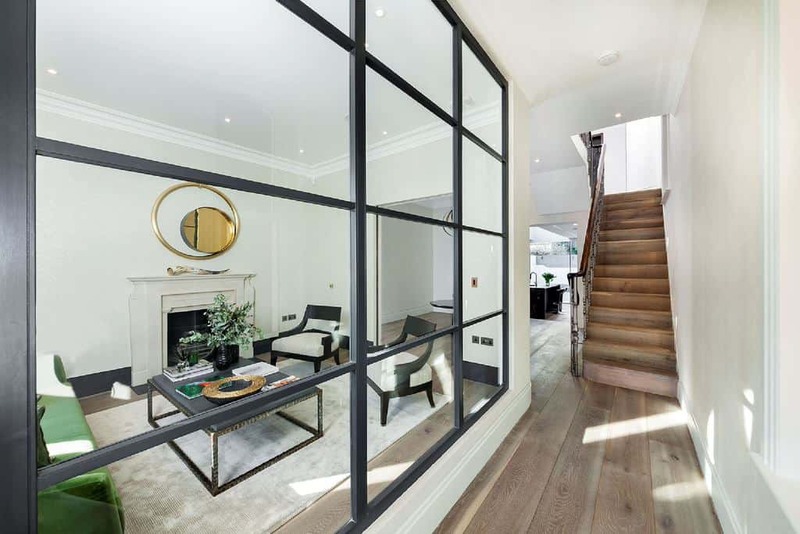 With a sharp decor style, you will find a modern luxury in this space. 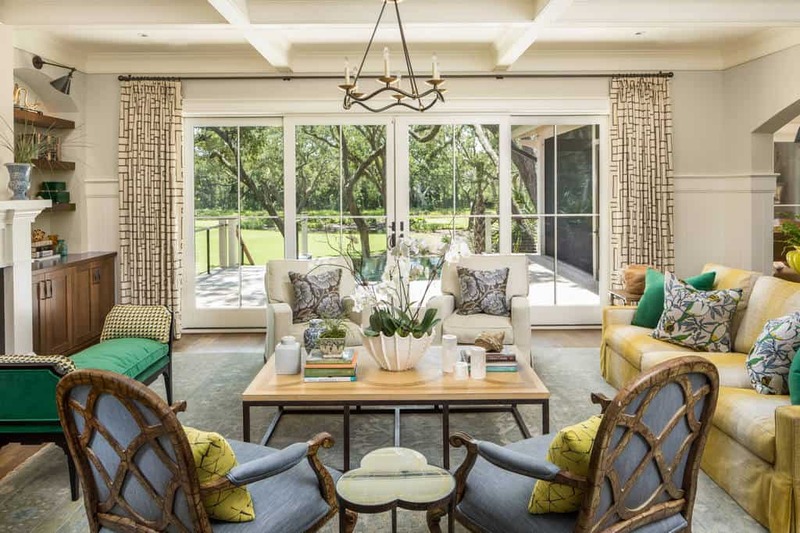 With plenty of light shining in through the many windows, you have a splash of yellow to bring this space to life. With doors that open right to the patio, you will enjoy this living room. 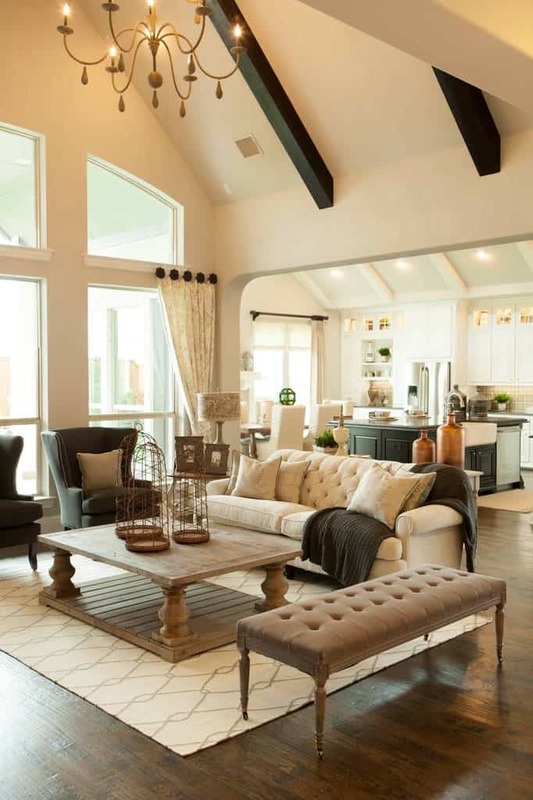 This space uses a great blend of colors and a charming design style to create an inviting environment. 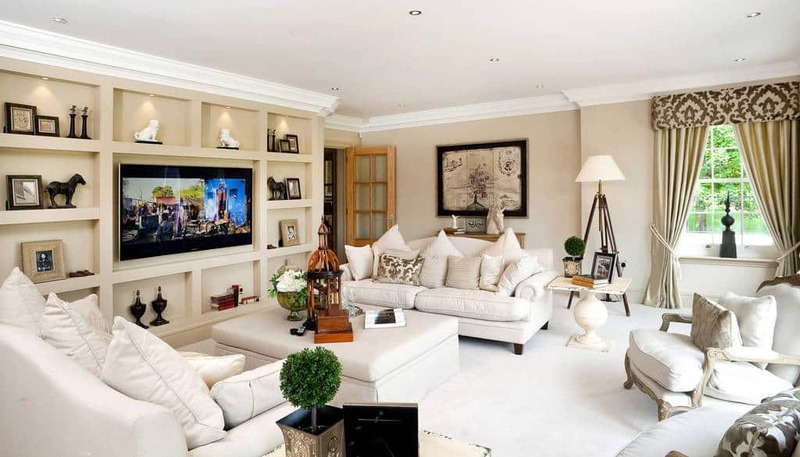 With beautiful and artful decor, this living room gives you a relaxing space to sit and watch some television. You will be kept warm from the fireplace and the room is connected to the rest of the house. 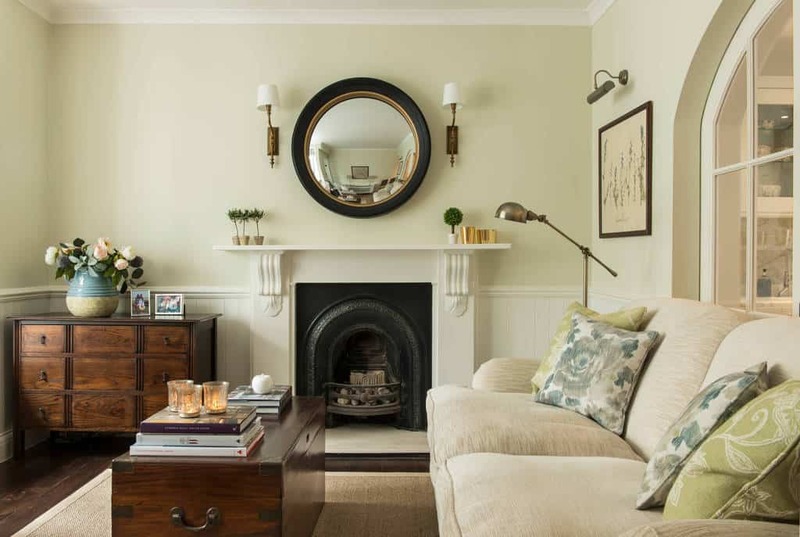 The wonderful furniture brings a light and charming style to this living room. 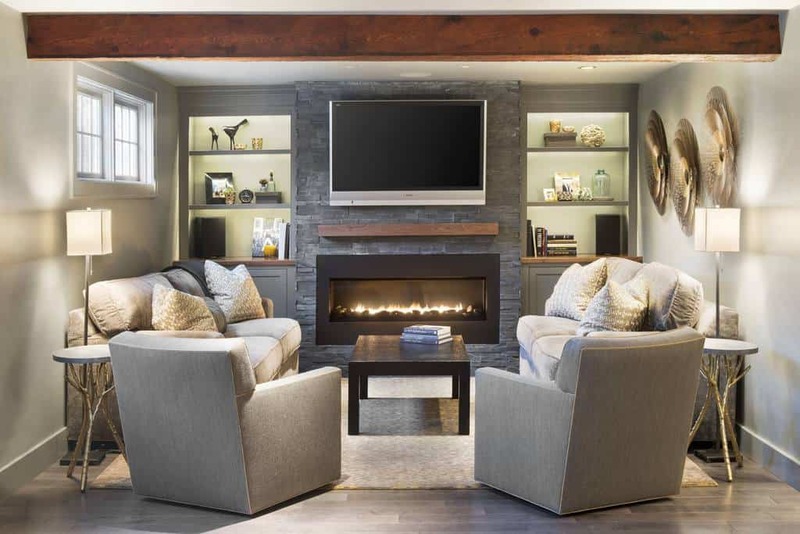 Gather around the fireplace and enjoy the easy decor of this space. 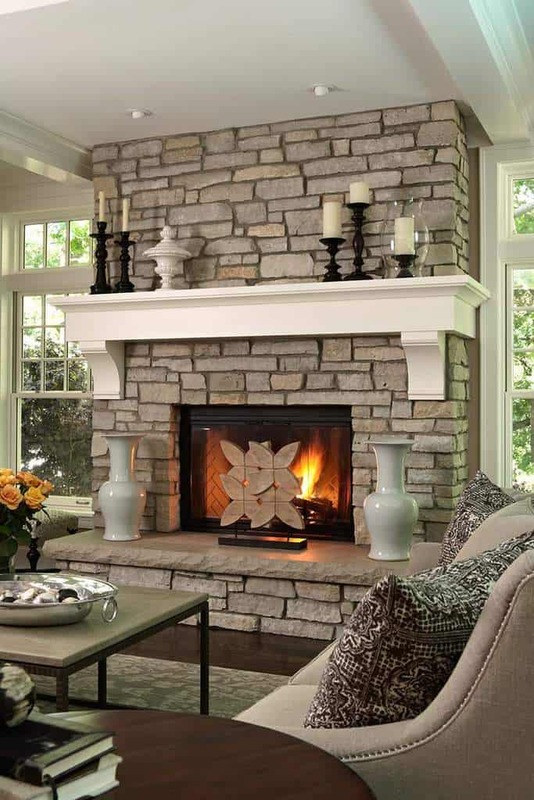 The cobble stone style around the fireplace blends perfectly with the hardwood floor and the surrounding shelves. The wicker furniture looks great and bring this living room an easy style. With wonderful lighting all around this room, you can really see how well the furniture goes with the beautiful hardwood floor. With a large and open floor plan, this room will provide entertainment for everyone. The fireplace takes center stage around this floor space, connecting the kitchen and living room. 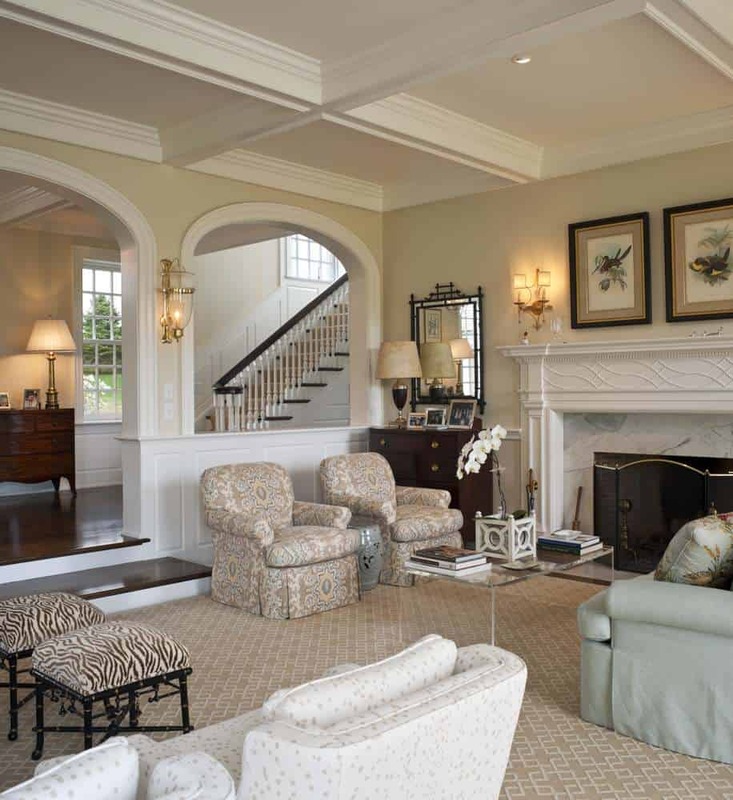 The natural light shines in on a comfortable space, with great traditional furniture. 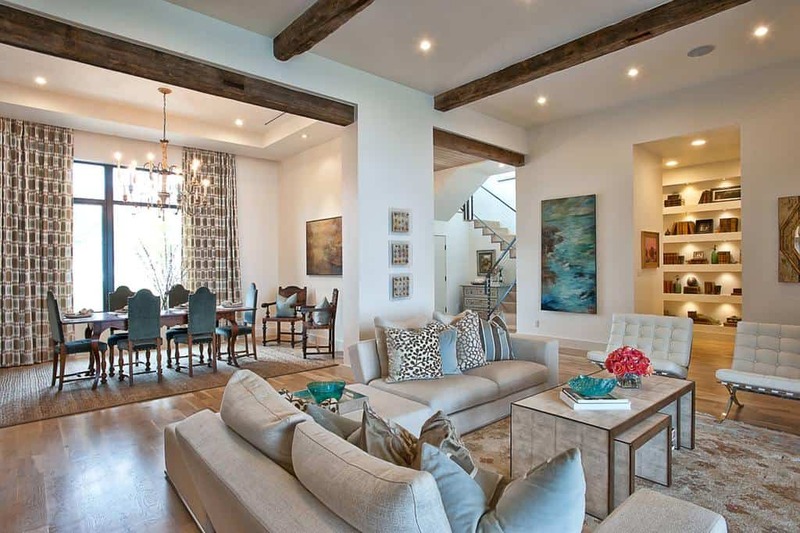 The exposed wooden beams in the ceiling and the hardwood floor set the stage for a bright modern living room. The whole space gathers around the fireplace and television, plenty of space for everyone. With a contemporary design style at work, the color contrasts between light and dark are perfect. The hardwood floor is set with a beautiful rug, giving this space great character. 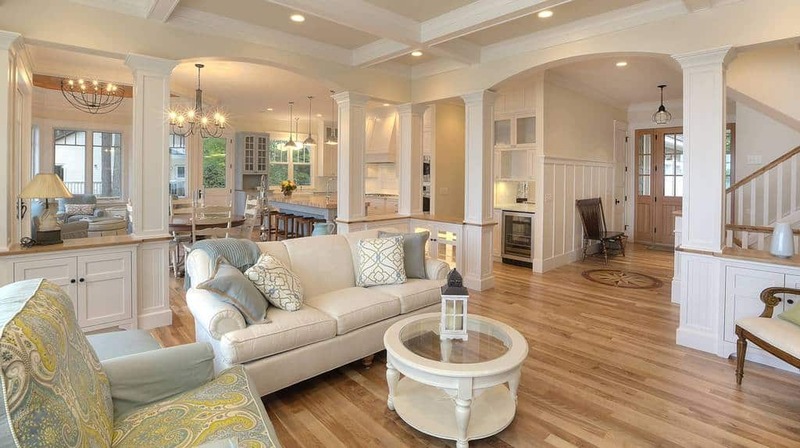 This living room is the front and center, connected to the other areas of the house by a beautiful hardwood floor. The wonderful use of blues throughout the space tie everything together. With a mid-century design at work with the furniture, this traditional space is the perfect area to come and relax. The comfortable and light furniture, together with the light rug, blend well with the hardwood styles around the room. With plenty of windows to open this area up, you can take in the natural light while you gather around the light stone fireplace and catch up on television. The furniture is has a classic sense of style and the decor simple and easy. With bold dark hardwood all around this room, the lighter rug and furniture creates a beautiful contrast. The ceiling is wonderfully designed, creating an elegant balance. The use of a solid darker blue for the walls of this living room create a great canvass to design around. 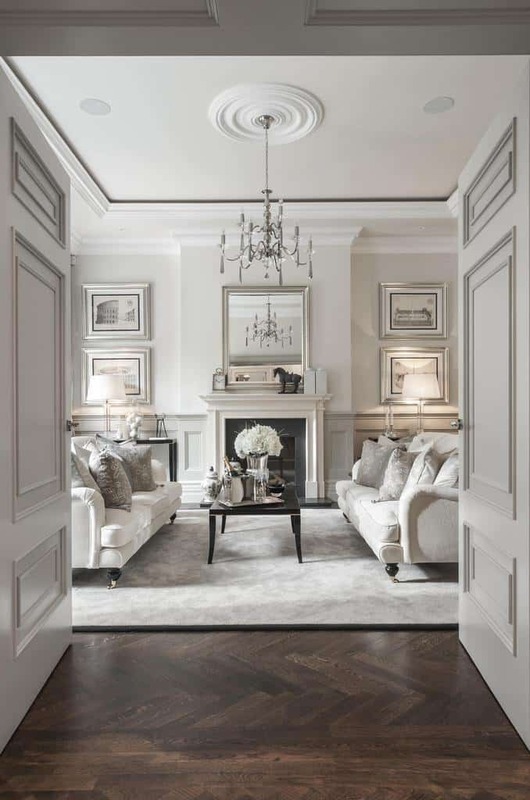 The fireplace and furniture create a simple European look, balancing between tradition and contemporary. When you have a dark and bold hardwood floor like this one, you can really create a great environment. The plant life decor blends with the darker hardwood furniture to make a tropical style. Well lit from the natural light shining in, this living room uses calm decor with a splash of color for life. The area is a mix of Bohemian art style and classic elegance. With this large living room featuring wonderful built in designs in the walls and ceiling, this space is elegantly furnished. 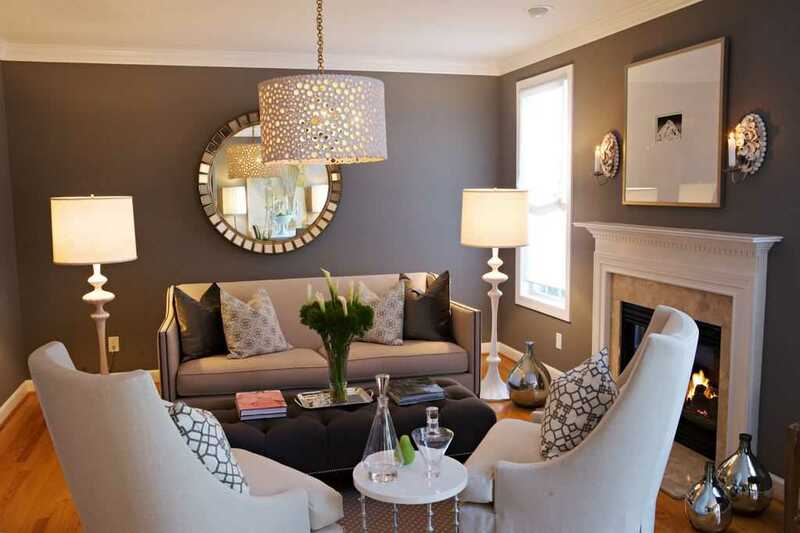 The decor is classy, creating a great blend with the overall style. The wonderful patterns in this furniture match the surrounding artwork well. With plenty of windows all around, you have great views and natural light spilling in. 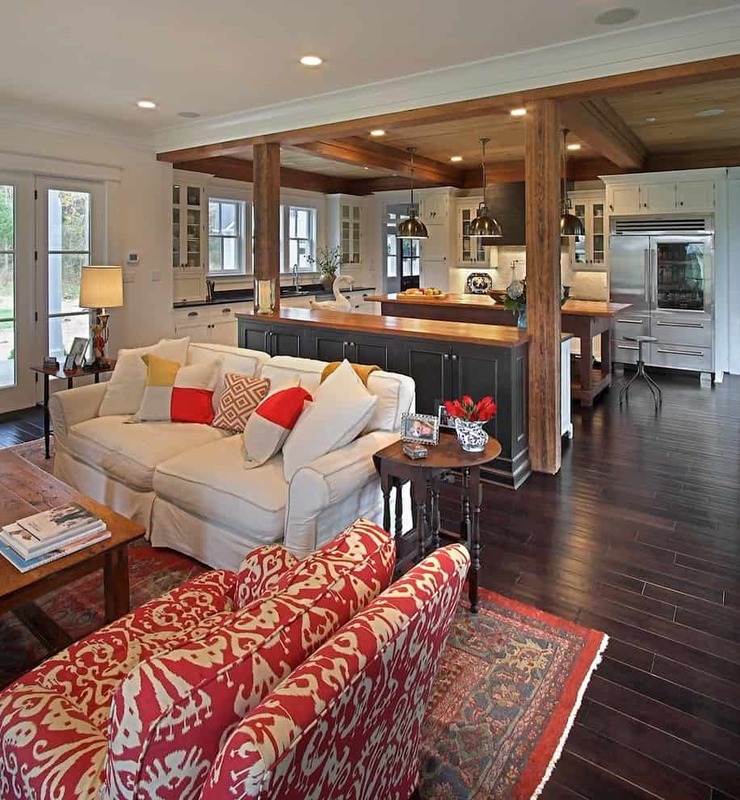 This living room is connected seamlessly with the kitchen area by the hardwood floor. The decor and furniture is stylish, especially this table with a simple frame and wooden boards. 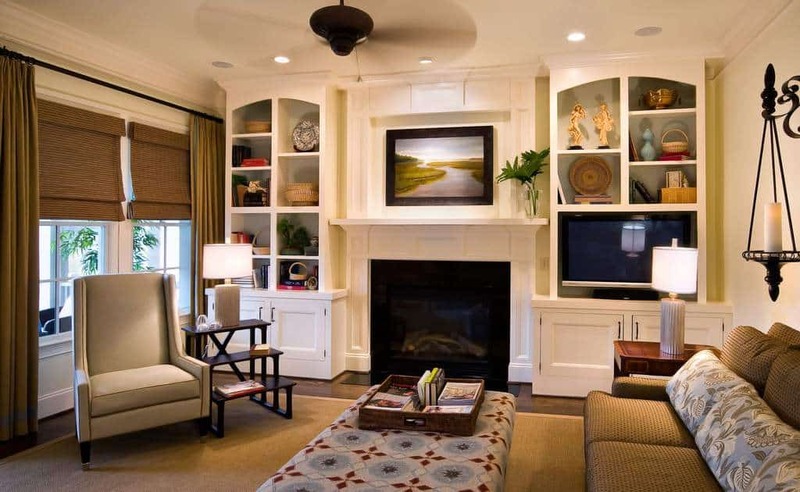 With great shelving to house this pleasant decor, you will love being in this living room. 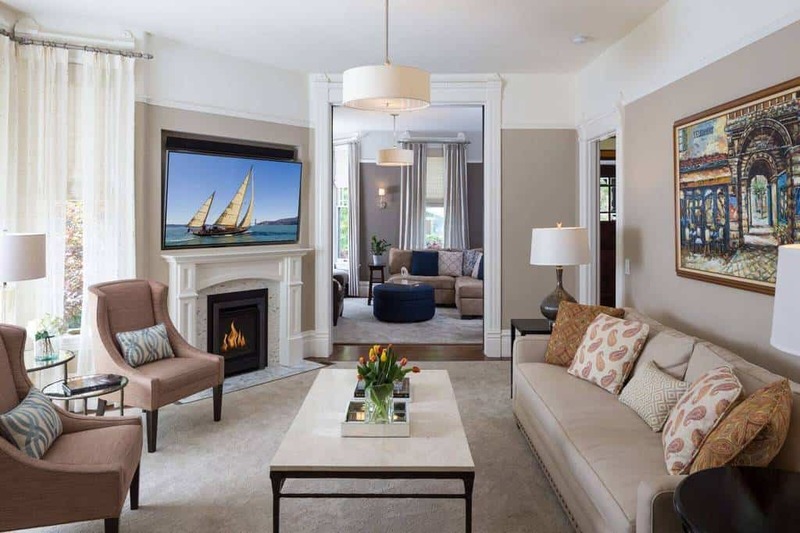 With plenty of space for everyone to gather around, you can catch up on the latest television shows as you relax. 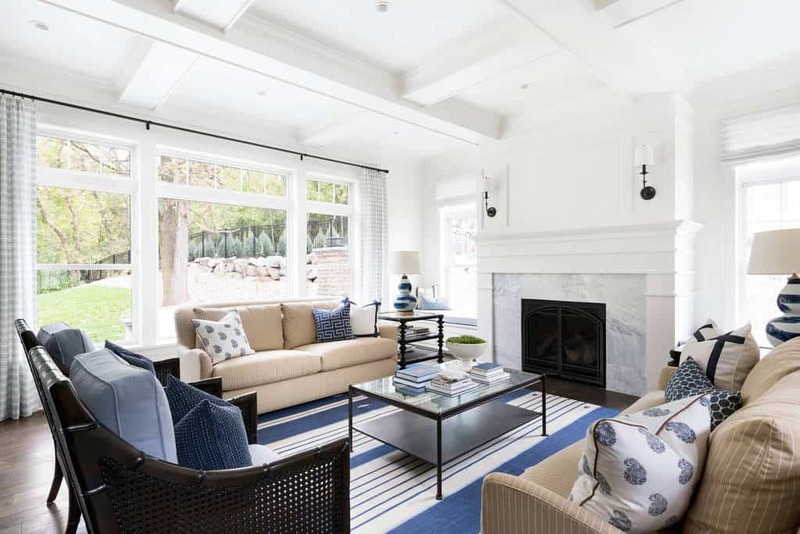 The combination of blue and white decor styles around this room tie everything together perfectly. The natural light pours into this bright space, showing off a modern design. 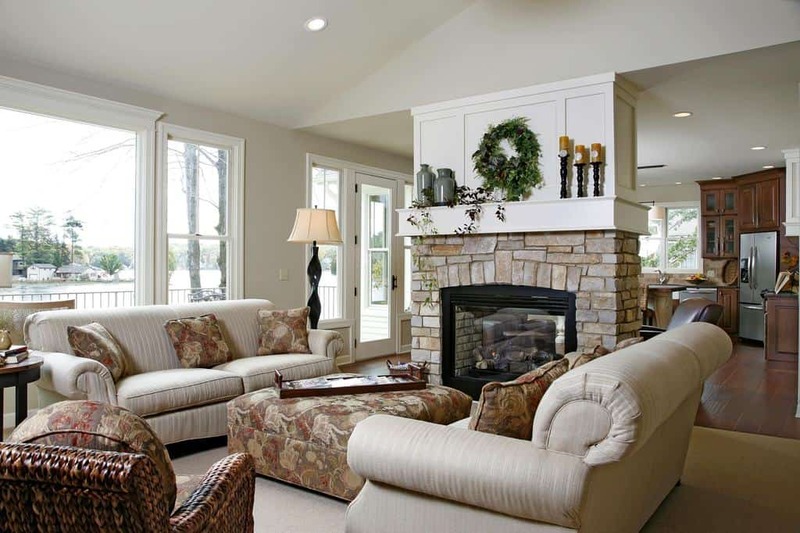 The eye-catching part of this living room is the stacked stone fireplace. The tall windows open the space up, showing off the wonderful earth tones used throughout the room. 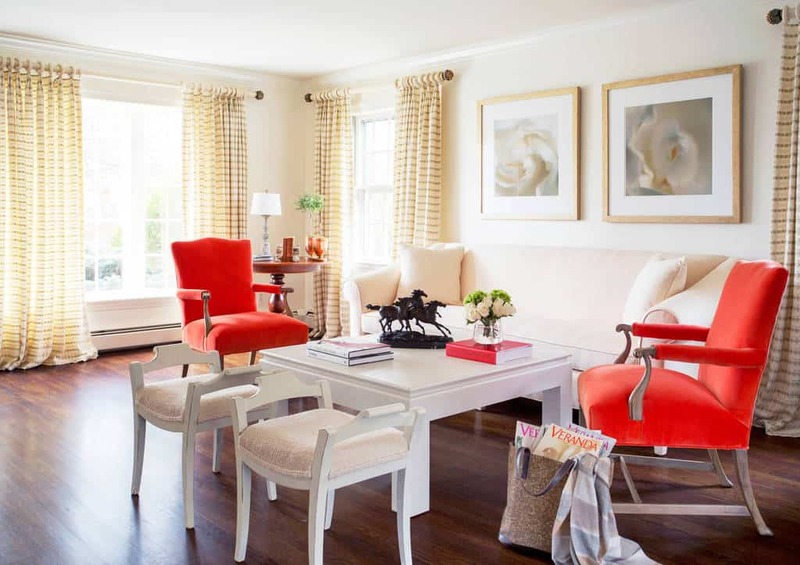 The different pieces of furniture around this room all use different design patterns that all complement each other. The decor and artwork matches the space perfectly, all creating a relaxing environment. 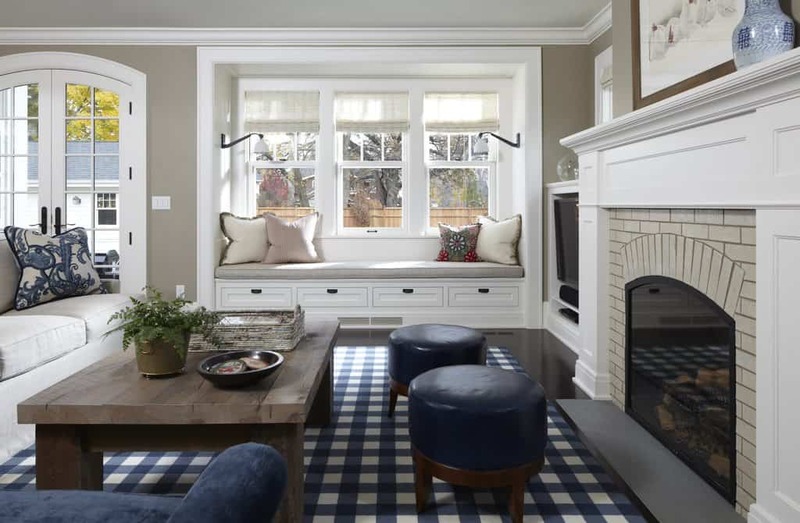 The checkered blue and white rug brings some texture to this space, wonderfully complementing the decor of this living room. The dark hardwood table has a weathered style, bringing great character to the room. 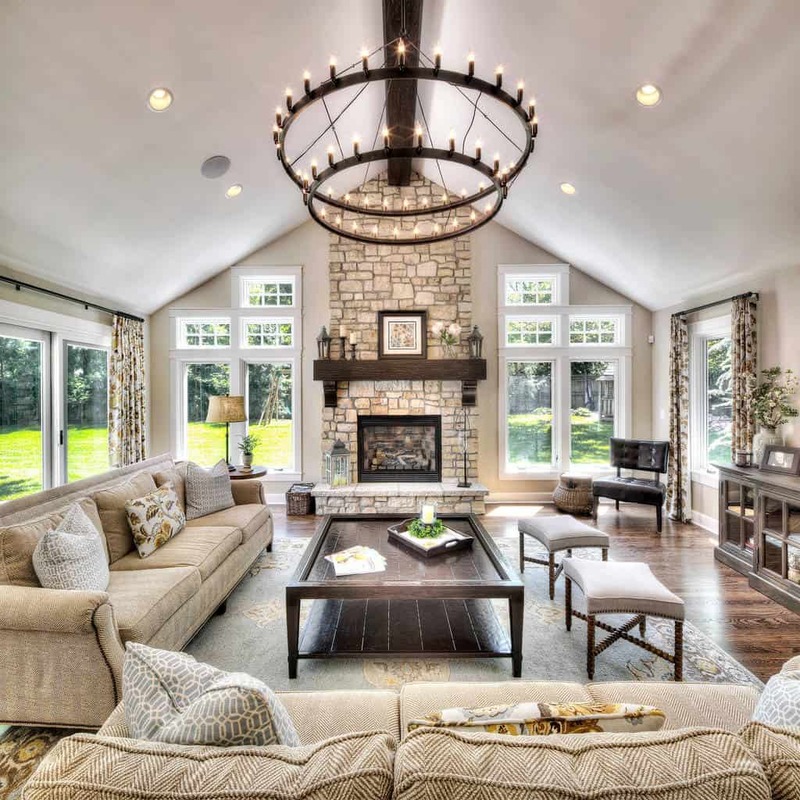 This living room has a beautiful design, with a tall ceiling and plenty of windows letting the light shine in. All gathered around the fireplace, this is the perfect place to relax. 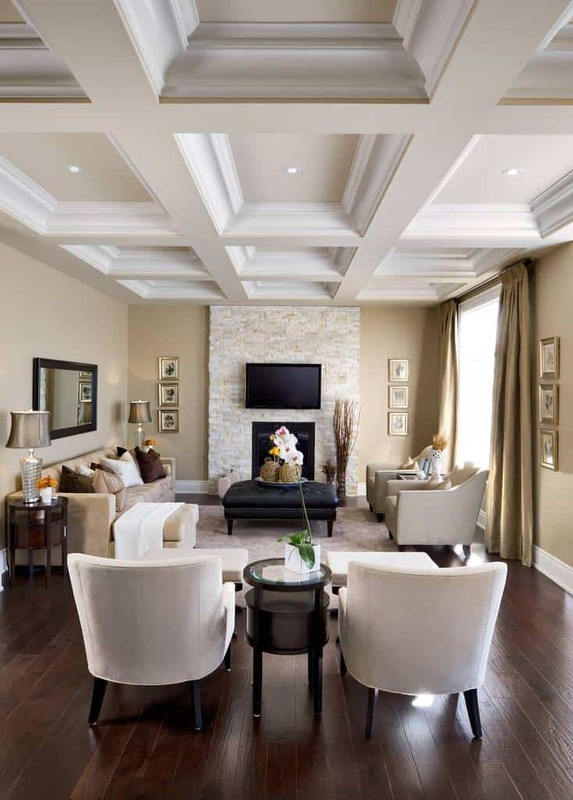 The rounded ceiling of this living room creates a wonderful atmosphere that is complemented by the handsome furniture. The hardwood designs used throught this space, from the floor to the decor, are beautiful. The hardwood floor and table in this living room are complemented by the great furniture and simple, elegant decor. Connected to the library, you will see this as a great cultural area. 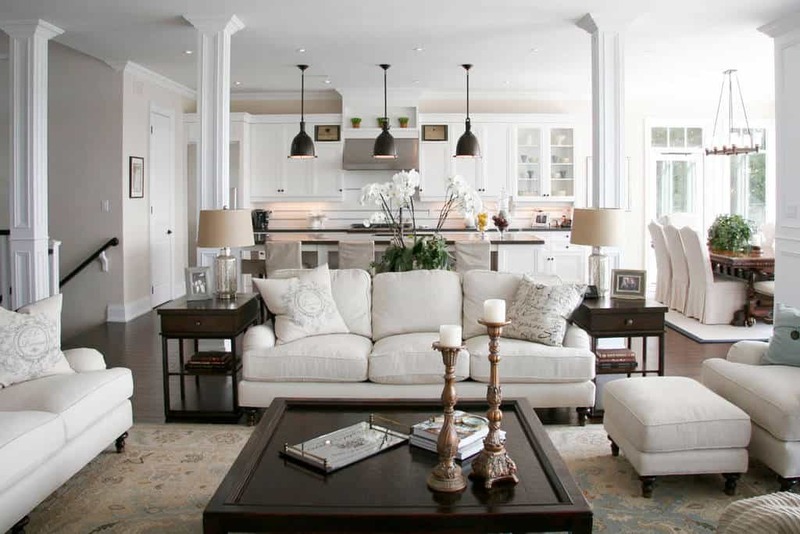 The light styles of this living room all blend together seamlessly. From the designed furniture to the beautiful hardwood floor, the decor style is steady from room to room. This living room is made for pure relaxation. 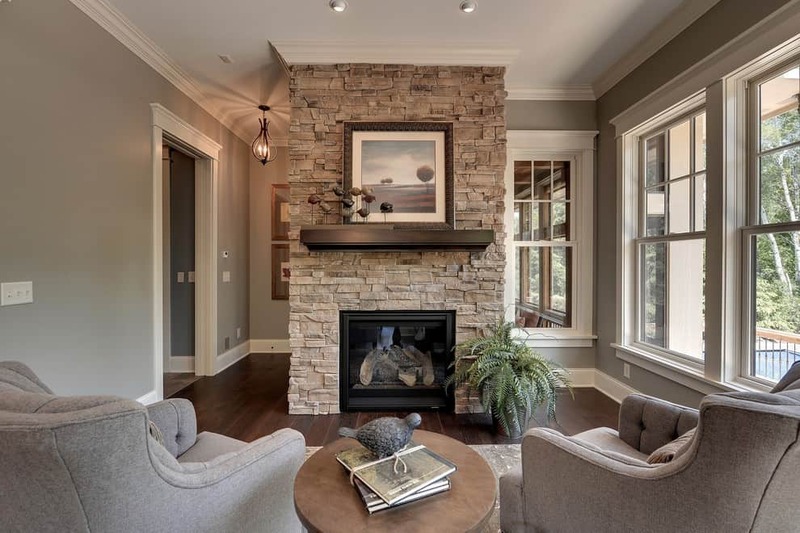 The stacked stone fireplace is beautiful and will provide you will plenty of warmth after a long day. 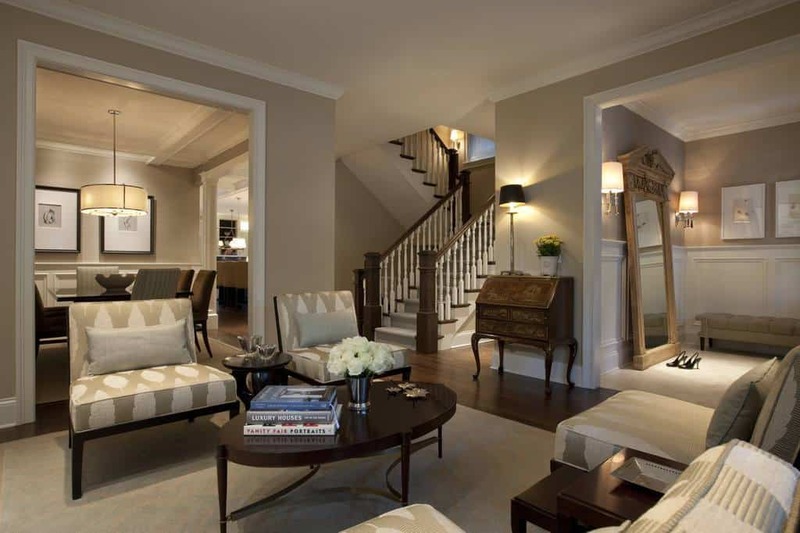 Around this living room, you can see how well all of the furniture and decor blends with the dark hardwood floor. 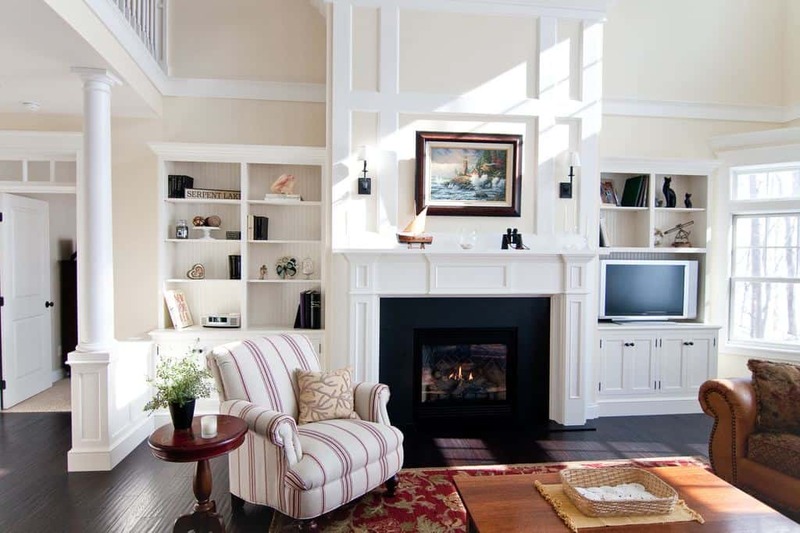 The shelves are filled with elegant decor and you will be kept relaxed by the fireplace.